On my 44th birthday, I launched Social Media Rehab as the sequel to Life@42. However, I have continued using the Life@42 blog to chronicle the 42+1 Live to Air Interview Series due to express interest. On November 1, 2012, Robert Lavigne did a Live to Air Interview with Dan Keldsen using Google+/YouTube Hangout. During the one hour session, they discussed “Why is Collaboration so HARD!” Further discussion ensued about Enterprise 2.0, Social Business, Gamification and Personality Poker. 42+1 Interview with Robert Lavigne and Mark Fidelman on Socialized! On October 18, 2012, Robert Lavigne did a Live to Air Interview with Mark Fidelman using Google+/YouTube Hangout. During the one hour session, they discussed Socialized!, Social Business, Enterprise 2.0, Social CRM, Collaboration, and Culture. Allow your friends/audience to build the playlist with you. They can add too! Your playlist is portable. Embed in your blog. Your friends (or even strangers) can embed the same playlist on their site as well! Your playlist evolves as your audience contributes. Robert Lavigne assembled interviews as a Listly playlist. Compare that to his playlist on YouTube. I reached out to the co-founder of Listly and extended an invitation for Nick Kellet to be a guest on a future episode of the 42+1 Live to Air interview Series <=== Live to Air will take place on May 13, 2013 <<<. We will be talking about @Listly, @Gifttrap, and community building. A part of that conversation with Nick, Listly cofounder, resulted in him asking me for a comparative analysis of a YouTube Play List to a Listly list as well as any feature enhancements the social platform could benefit from. YouTube Playlists vs. Listly Lists. Each playlist has a title and a description. A playlist can be public or private. You have the ability to tag entries as well as the playlist. You have the ability to drag and drop the videos within the playlist. You can add a video to the playlist from the video itself or add it using a url. When I do a Google search on my playlist name it brings up the playlist at the top and the popular YouTube videos from the interview series. You have the ability to play all the videos in the playlist using the ‘play all’ button. You have the ability to do a quick sort by view title, date, random, and reverse. And there are like and dislike playlist options. You have the ability to allow others to embed the playlist. An embedded playlist has play next, play, and view playlist to select, this allows you to navigate the playlist. You have the ability to share and embed your playlists on Facebook, Twitter, Google+, Tumblr, Blogger, MySpace, StubleUpon Digg, Reddit, and even email. Each playlist entry has the ability to have a video introduction, this introduction can be done using a webcam, a text intro with effects and duration established and preloaded audio, or you can upload an intro video. Every playlist entry can have a note which is separate from the title and description. You can adjust the start and end time for each entry, aka you don’t have to have the entire video play, (note you can feature just a segment of a larger interview just in your playlist). 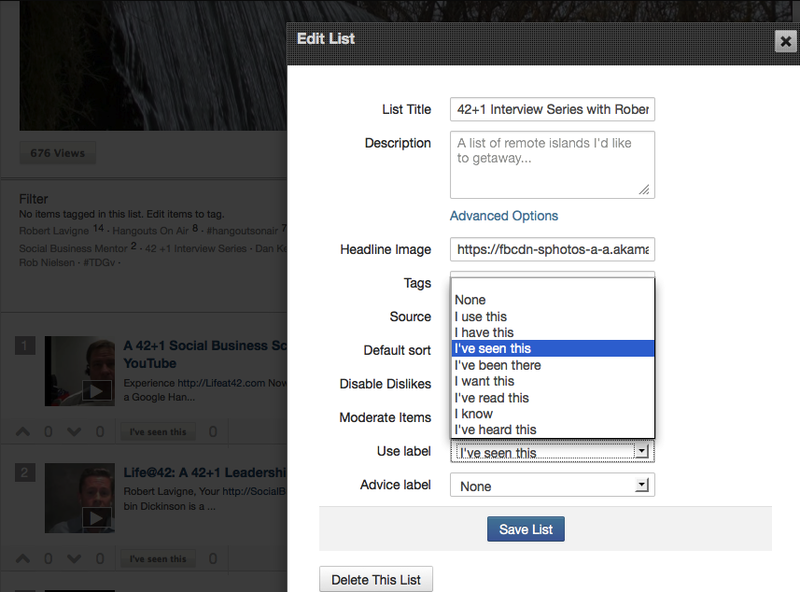 A Listly list has a title and a description, a headline image, has tags, source url, the ability to disable dislike, and disable moderation of items. Curation mode allows you to drag and drop to reorder. You have the ability to link to an item with link or item nolink allowing for both embedded media or straight text. When I Google search on my Listly List it brings up my Listly List as well as some YouTube videos below it that have been included in the list. You can follow a list versus subscribing to the YouTube channel. You have the ability to vote up and vote down list entries. You can order the list via crowd rank, curated, alphabetical, newest, or queue. You can do inline viewing of the video. You can filter based on the tag. And you can comment on a list entry. You can embed the list using WordPress, universal code snippets, or iframe code snippets. However to embed the list in WordPress requires a plug in as well as a publisher key which is free with registration. You have the ability to share a listly list on Facebook, Twitter, Linkedin, Google+, as well as email. You can relist an entry in your own list from someone else’s entry. You have the view count of the list meaning how many people have seen the list. You have the ability to flag a list item with I’ve seen this entry which also has a count of how many people have seen this. You have a comment count. You have list statistics which includes views by host, who are the curators, and who are the followers. Listly has a used label as well as an advice label (see pictures). This Life@42 Blog Post was produced in collaboration with Ditto General Transcription Services in Brantford, Ontario. On April 1, 2013, Robert Lavigne did a Live to Air Interview with Dino Dogan using Google+/YouTube Hangout. During the one hour session, they discussed “how to blog for content and be truly personal/social on the other platforms.” Further discussion ensued about Triberr, Blogs, Social SEO, Automation, Tribes, and Bonfires. Why is Collaboration so HARD! On October 23, 2012, Robert Lavigne did a Live to Air Interview with Greg Lowe using Google+/YouTube Hangout. During the one hour session, they discussed “Why is Collaboration so HARD!” Further discussion ensued about Social Business, Enterprise 2.0, and Enterprise Social Networks. On October 15, 2012, Robert Lavigne did a Live to Air Interview with Christine Skulevold using Google+/YouTube Hangout. During the one hour session, they discussed Empire Avenue, Instagram, and Social Media Addiction. Organizations are increasingly challenged by unparalleled competition and looking for ways to be more productive, flexible, and cost effective. Real estate represents a cost that is continually increasing, but the value of which is declining. Real estate represents location dependence, in order to work and carry out tasks; employees commute from home to the location every day, increasing the organizations carbon footprint. In response to these challenges organizations are increasingly shrinking their real estate portfolios, and leveraging Unified Communications and Collaboration Software tools to create location independent, “technology mediated, work environments”. These environments allow remote, or home working, and new team formats such as High Performance Teams to improve productivity, and performance. Employees win with remote or home working, they no longer suffer through commutes that equate to lost time, effort, stress, and cost, all factors on the negative side of the work / life balance. This eBook looks at these challenges and responses, and how to implement an effective remote work/work from home strategy. Organizations need to plan thoroughly, and carefully, but above all, employees must understand and buy in to the initiative to make it a success. To be successful employees need training and support, management must know how to monitor, and mentor, employees they may rarely see. On October 14, 2012, Robert Lavigne did a Live to Air Interview with Kevin Green using Google+/YouTube Hangout. During the one hour session, they discussed Empire Avenue, Social Media, and Social Networking. Of particular interest, a discussion on how Kevin Green became the most successful member of the Empire Avenue community. On October 12, 2012, Robert Lavigne did a Live to Air Interview with Doug Wolfgram using Google+/YouTube Hangout. During the one hour session, they discussed Empire Avenue, Interactive Media, and Social Selling. Of particular interest, a discussion on the evolution of Multi-Media as a competitive business advantage. Stephen M. Shapiro asserts, “well-intentioned leaders, in their attempts to boost innovation, are inadvertently destroying it,” in his latest book, Best Practices are Stupid. Stephen proceeds to present “40 ways to out-innovate the competition” in an attempt to rectify this all to common backfire. I have been fortunate to have been introduced to Stephen Shapiro by my good friend Dan Keldsen. It is no surprise that Dan is mentioned in the acknowledgements for Best Practices Are Stupid. Dan is a genuinely smart man and tends to hang out with those who share his desire to innovate and collaborate. Dan asked me to lead a Personality Poker session a few years back. It was then that I got introduced to the work of Stephen Shapiro. I was impressed by Stephen’s ability to take a game and convert it into a learning exercise. These games allow participants to share their insights collaboratively with the intent of innovating collectively. When I started reading Best Practices Are Stupid, it was clear to me that new innovation and collaboration games would be introduced through the unfolding chapters. I finally got to meet Stephen Shapiro in real life at the 2012 The Art of Leadership in Toronto produced by The Art of… Productions. Throughout the day we were exposed to insights by the likes of Marcus Buckingham, Carrot Guy, and other leadership visionaries. At the end of the event, after Stephen Shapiro presented, we discussed The Art of Leadership Conference | Toronto | June 5, 2012 and his BEST PRACTICES ARE STUPID: 40 Ways to Out-Innovate the Competition. Here are three segments that made up my 42+1 Leadership Interview with Stephen Shapiro. On September 16, 2012, Robert Lavigne did a Live to Air Interview with Kim Reynolds using Google+/YouTube Hangout. During the one hour session, they discussed Empire Avenue and Social Media. Of particular interest, a discussion on Social Media Pressure and Authenticity provided much insight. 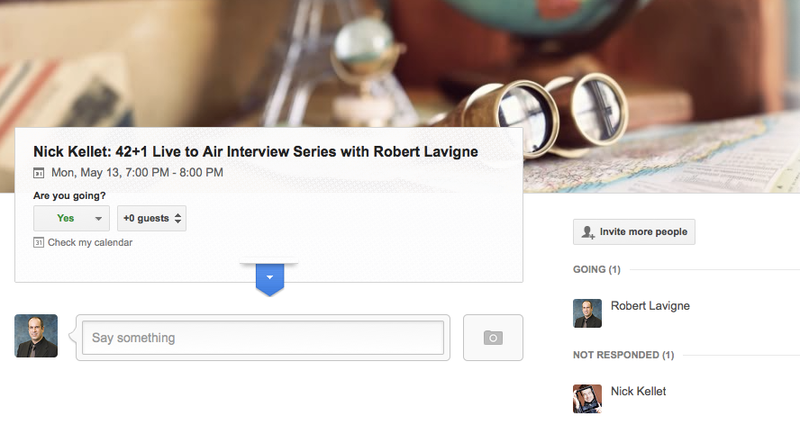 On September 15, 2012, Robert Lavigne did a Live to Air Interview with Rob Nielsen using Google+/YouTube Hangout. During the one hour session, we discussed Empire Avenue and Social Media. Of particular interest, a discussion on Social Media Fatigue and Weak Ties (Social Networking) provided much insight. On September 14, 2012, Robert Lavigne did a Live to Air Interview with Michael Q Todd using Google+/YouTube Hangout. During the one hour session, we discussed Empire Avenue and Social Media. What is Inbound Marketing? What is an Invention? What is MESH Conference? What is Towel Day? On March 28, 2012, I recorded the second installment of the 42+1 Screencast Interview Series. My remote guest was Robin Dickinson of Sydney, Australia. Robin is a proven business facilitator who will get you diamond-focused on the plans, strategies & tactics that deliver lasting success. The interview was recorded using Google Hangout from Brantford, Ontario. In this interview, Robin Dickinson discusses Virtual Collaboration, Diamond Focus, Productivity Basics, Organizational Lifecycles, Social Media CRAP Test, and Mobil Apps Innovation. Context is Everything. Always factor it into your Social Media Business Equation. I first read Eve Mayer Orsburn’s The Social Media Business Equation shortly after blogging How the Brantford Library understands “The Social Media Business Equation” by Eve Mayer Orsburn. Since then I have read it three times before actually sitting down and writing this blog post. The question of deadlines is an interesting element of business. Do you focus on imposed timelines or focus on quality deliverables. As a certified Project Management Professional (PMP), I probably should lean towards timelines, but I consistently lean towards the agile side and prefer to focus on incremental deliverables and consistent quality over imposed, often arbitrary, timelines. So while I was reading and re-reading The Social Media Business Equation, I made a point of posting regular entries on my Social Business Mentor blog until I was ready to write this review. One of the topics I recently talked about on that blog was the re-purposing of content. This is a key message also discussed in Eve Mayer Orsburn’s book. You can read more about my take on re-purposing content by reading Your Key Inbound Marketing Strategy is Re-Purposed In-Flow Content. Having a Strong Engaged Tribe Doesn’t Hurt Either. So let’s get down to the review shall we. Let us discuss the hidden gems that are found in Eve Mayer Orsburn’s The Social Media Business Equation. It really comes down to this. All the equations in the world do not matter unless you factor in the context of your target audience. This applies to traditional marketing, inbound marketing and social media marketing. That valuable context is only achieved when you actually listen, engage and provide targeted value to your audience. In The Social Media Business Equation, Eve Mayer Orsburn makes it clear that you can no longer broadcast your message. You need to be part of the conversation that is occurring all around you in the vast world of Social Media. You need to communicate and often re-learn how to communicate as we have gotten lazy in our pursuits to push our “buy, buy, buy” messages. You should be engaging not only with those who share your space, but pay special attention to those who will value your content and eventually purchase your product or service. This cannot be achieved by having one silo of your business engaging in Social Media. One department does not make your business, nor should it be the only voice being heard or ear listening. More importantly by leveraging your “crusading customers” the effort to spread your message is reduced exponentially. In The Social Media Business Equation, Eve Mayer Orsburn formulates that it is made up of 20% Informing, 20% Entertaining, 40% Interacting, and 20% Converting to Business. This plays very much into the standard 80/20 rule often found in successful models. In her equation, 80% of the time is spent on engaging with the potential client, while only 20% is spent on converting that lead into a sale. So in that respect, I fully support her take on how businesses should focus their efforts in using Social Media as a tool for lead generation and sale conversion. She further indicates that most Social Networking efforts should be 80% Reward and 20% Work. Overall, the Pareto principle is in full effect throughout Eve Mayer Orsburn’s book. There is also one other aspect to The Social Media Business Equation by Eve Mayer Orsburn that leverages the Pareto principle. The first 80% of her book is comprised of a mix of insights and examples (18 valuable use case examples in total). The other 20% of her book is 50 pages of acknowledgements to those who have contributed and engaged with her since she ventured into the world of Social Media. My alter ego @RLavigne42 is actually listed on page 177 of her book in the acknowledgment section. Some may question why she dedicated 20% of her book to acknowledgements. Well think about it, that is 35,000 people who will go to the end of her book to see if they have been mentioned. That is 35,000 people who upon finding their twitter handle, will make a point of mentioning it to their Social Network. The Social Media Business Equation will now spread through the social graph of that first tier and expand to a network that would not be aware of this book. That 20% is the part of the equation that involves converting the effort of the 80% of work into further sales. When all is said and done, that is the nature of Eve Mayer Orsbun’s equation for Social Media success and eventual ROI (Amplify and Magnify through Engagement). So for those of you wondering why there is a barcode at the beginning of this post. That barcode equates to 42. That barcode was tattooed on my lower neck on October 10, 2010 (10/10/10). For those of you that understand binary, 101010 is 42. When all is said and done a barcode means nothing without the context that it is associated with. All equations should factor in context. Never ever forget that. Tomorrow is a Brave New World! Tomorrow I am turning 42. On February 29, 2012, I kicked off the Life@42 Social Business interview series appropriately called 42+1. Using the power of Google Hangout and Skype, I would reach out to my extended network and bring in remote guests to the Social Business Hangout. This weekly meetup is my opportunity to provide Social Business mentoring to the Small and Medium-sized businesses based out of Brantford, Ontario. The new 42+1 Social Business Screencast will occasionally compliment the ongoing Live Podcast that is part of the Social Business Hangout. To kick off the series, I could think of no one more deserving than Tim Burrows of the Toronto Police. Tim played an instrumental role in the development and implementation of their Social Media strategy. In this interview, Tim recounts the humble beginnings of what has become a benchmark for Social Media programs within the Police community. Tim shares his insights on Twitter, Facebook, YouTube, foursquare, analytics, community and above all else engagement. It was an absolute honour to have Tim Burrows on the inaugural 42+1 Social Business Screencast. On February 8th, 2012, I introduced the NEW NEW Twitter to the #BRANTS Social Business Hangout. Every Wednesday night, I mentor the local Small and Medium-sized Businesses (SMBs) in the Brantford area on Social Business (e.g. Enterprise 2.0, Social CRM, Social Media). Each week as part of this meetup, I also record a live podcast called “What’s on YOUR Mind? #BRANTS, which is hosted by #TDGv Studios. The podcast that night was a HOTSEAT Q&A on Twitter. After the recording of the podcast, I was asked to do a Life@42 Workshop on Twitter. This presentation would provide an introduction to Twitter to new users. This presentation would also provide an overview of the NEW NEW Twitter User Interface (UI). I make a point of always recording my presentation, so that I can share it with those who are not physically in attendance. With that I present to you the Life@42 Introduction to the NEW NEW Twitter. On February 1st, 2012, I introduced Google+ to the #BRANTS Social Business Hangout. After recording the podcast, we typically have a round table discussion on the topic at hand. This week, I was asked to do a Life@42 Workshop on Google Plus instead. With that I present to you two alternate versions of my Life@42 Introduction to Google+. I make a point of meeting with the Brantford Library Community Managers, whenever I visit their library. As mentioned in a previous post, the Brantford Library Community Managers “GET IT”. Because they “GET IT”, I want to keep helping them better leverage their Social Media endeavours in Brantford. Each visit to the Brantford Library presents an opportunity to provide some onsite Social Business mentoring. We talked about how the Brantford Libary can better search Twitter for trending topics, leverage Hashtags and discover community dialogue. Earlier in the day, the Brantford Library sent out this tweet commemorating Charles Dickens‘ 200th Birthday. "Have a heart that never hardens, and a temper that never tires, and a touch that never hurts." Well said, Mr. Dickens. Happy Birthday. After a little bit of twitter mentoring, the Brantford Library sent out this revised and well formed tweet. As you can see, with a little bit of research, the same content can be exponentially improved for Twitter. The Brantford Library now recognized that “Charles Dickens” was trending and not just “Dickens”. 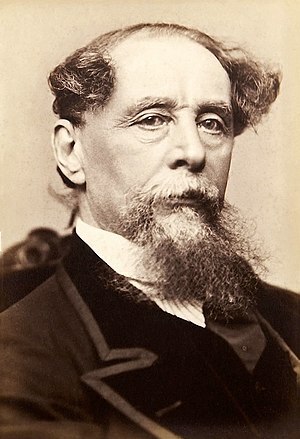 The Brantford Library now recognized that #Happy200Chaz and #Dickens2012 were popular Hashtags celebrating Charles Dickens’ 200th Birthday. The Brantford Library now recognized that by using a bit of keyword and SEO research prior to sending out a tweet, that same content would be seen by a far wider targeted audience. To learn more about “What the Heck is a Hashtag?“, here is a Life@42 Workshop segment featuring Robert Lavigne, your Social Business Mentor. It was a night of many tweets. One conversation leading to another. Everything leading to this eventual engagement. Interesting. @Jan4Ward1 says he's resigned from the @BtfdLibrary because he has "too many other fires to put out." The Brantford Libary had the Social Business frame of mind to engage with this new arrival to their town of Brantford. Well I got to sit down and chat IRL with Tom and Paula. I even picked up my new Brantford Library Card. Let me tell you this in very clear terms. Simply put, the Brantford Library Community Managers “GET IT”. They understand that it is not about the number of followers, the number of web hits, the cut of one’s jib, the smell of one’s clothes, or one’s klout score. They understand that every tweet is an opportunity to engage in dialogue and expand their Social Network and TRUE Social Influence and TRUE “Klout”. They understand that every tweet is an opportunity to expand their Social Business through TRANSPARENCY, COLLABORATION and ENGAGEMENT. How does all this relate to Eve Mayer Orsburn’s new book “The Social Media Business Equation”? Eve Mayer Orsburn aka @LinkedInQueen was one of the first people I started following on Twitter back in 2009, when I transitioned to my 2.0 Lifestyle. I am connected to her on LinkedIn. I am friends with her on Facebook. It has been a very long time since Eve and I did any form of dialogue via our shared Social Media connections, as we both lead very busy and public lives. I have been able to keep up to date on her travels, her family life (Hello Mia), her business success and her book “The Social Media Business Equation“. It is only fitting that the first book I have checked out of the Brantford Library, is one that I have been looking forward to read for a very long time now, Eve Mayer Orsburn’s “The Social Media Business Equation“. So to make my point very clear to those in Brantford preaching Public Transparency and Engagement. Don’t be an Egg, and ENGAGE with those who opt to ENGAGE with you on those platforms you opt be TRANSPARENT. You might be surprised who walks into your door and COLLABORATES. Chapter 4 of @smanalyticsbook reminds us again how we are dealing with the "world's biggest focus group". And people question the ROI of FB! Interesting viewpoint on US Patent 20100145902 & "dark web" analysis by @smanalyticsbook. Only 1% is now indexed by Google. Noise is coming! @TDGv correct – what to listen for in each region/language is not often that clear cut. Sitting down to write the http://t.co/qgscpUGH review of the Chapter THREE of @smanalyticsbook. Thank you Marshall for engaging in comments. In Chapter 3 of Social Media Analytics, Marshall Sponder kicks it up a notch and goes global, international, worldwide and universal, all the while remaining local. The Three things you may not know about Magisto, and what Magisto could do for YOUR brand! In a previous post, Robert Lavigne provided his insights into the Video Production capabilities of Magisto. Today, we are proud to announce that Life@42 will be featured in a new Meetup in Brantford, Ontario. The first event will by invitation only. This will allow us to iron out the format and content with some fellow advocates of Social Business within the #BRANTS Community. That’s the old way of thinking! Put your context out there. Associate it with content that is already out there. Bring that content into your feed. Make use of favourites and playlists. Find content that other people have created that is relevant to what you do, and bring it into your channel. You don’t have to create it all yourself. There is enough content out there. But what you bring. What your real value is. Whether your are one person, 25 people, 500 hundred people, a million people. What you bring. What your real value is the CONTEXT. People want context that they can relate to. They are shifting in droves. In a previous post, Robert Lavigne outlined the origins of his statement. In this follow up blog entry, we will delve further into his recent statement. Value YOUR Context. Engage YOUR Community. The Spectrum of what is out there, is so diverse. It is far reaching and wider than you probably already think. This “stuff” is coming! In some places, it’s already here. There is a strong pendulum going on in the global economy. These strong pendulums are pushing back. They are taking use back to the days of the Farmer’s Market. To the days when we were interacting with people. When we were sharing ideas, sharing our ideals and sharing our opinions. You are seeing a strong demand for that. There is a reason why most organizations don’t have engagement. We have dulled it out of our “resources” for the last Twenty Years. So when you have GenY coming into the workforce. When you are interacting with GenX and GenY within your business. Keep in Mind. This is the world they are exposed to. These are the ideals they are expressing too. These are the people they are listening to. They are expecting more, because they have come to one realization. If there is one take away you should have from this, it is THIS. Context is where the VALUE IS. There is more content out there to last you the rest of your life. When you have a Content Economy. Where things are FREE, they become a commodity. What is VALUE in a Commodity Market? Here is a recent example of what I mean by this. How can Hamilton Carpet Clean make the best of Social Media by leveraging their existing YouTube Channel? In this Life@42 Segment, we will partially answer Laurie’s question using the Hamilton Carpet Clean YouTube Channel as an example. First off, I love the fact that their featured video has a thumbnail with key contact and “what’s in it for me” information. Even the description of the video has valuable information relating to their website, a call to action and relevant traditional contact information. The channel is lacking an avatar. This leads users to believe the site is not active. This needs to be rectified immediately. The channel name is their channel name. You may think this is an odd statement, but keep in mind, you are not limited to the URL name when naming your actual channel page. This could easily be “Hamilton Carpet Clean” or “Clean Carpets @ 519-512-2047”. Disclaimer: I have not tested these for valid YouTube formatting for invalid length or characters. They only have two uploaded videos. They are 2 months old and 5 months old respectively. Mix that with the lack of an avatar and you have a clear indicator of a “static” channel. If you cannot produce more videos, consider making use of the “Favorites” feature to showcase relevant content from third-party channels. Now don’t get discouraged, all of these are easily fixed and I will give you a few insights as to how. Now you can connect with Brantford Entrepreneurs over the lunch hour! Open networking: 11:45AM. This group will meet at 12 Noon on the fourth Friday of each month. The format shall be similar to our other Meetups. Meet fellow entrepreneurs, introduce yourself and your business, exchange business cards and materials, hear a pre-recorded or live presentation that focuses on one or more aspects of running a small business, and engage in group conversations following the presentation. Limited to 32 attendees. The power and scope of Facebook Timeline is beyond its current scope. Robert Lavigne enables FB Timeline. Drop by my profile and check out Timeline for yourself. Muay Thai Sparring Exhibition Night for Africa! Another exciting exhibition event for Muay Thai and martial arts fans! Come watch top athletes from teams across Ontario show their technique in playful sparring exhibition matches. This event will feature over 10 matchups. We are pleased to announce that 100% of proceeds will be donated to “Save the Children Canada” towards the current emergency famine. It is the worst drought that Africa has seen in over 60 years affecting approximately 12 Million people. This week we feature Robert Langley (@2020lifeline). Robert explains “What is a Meetup?” to fellow #Brants. Welcome small business owners to our Meetup where you will meet like-minded entrepreneurs in an informal, fun, learning environment. Our Meetups are focused more on generic professional development and business building strategies, than on individual lead generation activities. BRANTford entrepreneurS (BRANTS) are encouraged to voluntarily follow up directly with fellow BRANTS after our Meetups to discuss individual needs and customer profiles. All attendees will have a chance to formally introduce themselves and their business to our group, and to exchange business cards and promotional materials. See you at our Meetup! Introducing Magisto! #TDGv Studios experiments with the new YouTube integrated Auto-Editor. Want a Great Upper Body Workout? Learn to Play the Drums! Robert Lavigne was fortunate to be introduced to Vinnie Mirchandani back in September of 2010. Vinnie was then touring his new book “The New Polymath” at a local meetup in Toronto, Canada. It was not until Robert heard Vinnie describe the term to him that he realized, “I am a Polymath“. Robert Lavigne often use his video interview with Vinnie Mirchandani to kick off his Life@42 Workshop. The Life@42 Workshop focusses on Personal Branding, Social Media Mentoring and Social Business Leadership. Here is Vinnie Mirchandani’s take on what is “The New Polymath”. A Polymath—the Greek word for Renaissance Man—is someone who excels in many disciplines. The New Polymath is an enterprise comfortable with multiple technologies and is packaging 3, 5, 10 strands of infotech, cleantech, healthtech, biotech and nanotech to create innovative new products and solutions. The wide innovation coverage in the book reflects Vinnie Mirchandani’s varied technology experiences and rolodex. He is President of Deal Architect Inc, a technology advisory firm. The firm helps clients take advantage of disruptive trends like cloud computing and business process outsourcing (BPO) before they go mainstream. March 2009 was the genesis of @RLavigne42 and I look forward to recounting that in a future blog entry.